Last week, I went to the store without a plan, which is generally a bad idea. Normally, I'm not so good at shopping without something specific in mind and I end up with 11 ingredients that don't go well together and a pint of ice cream. I had it in my head that I wanted something beefy, but I wasn't sure what that might be. When I saw boneless short ribs, I remembered a really delicious short rib chili I once had, so I Googled a recipe while I was in the store, picked up all of the ingredients, and off I went to cook. Food 52's Short Rib Chile was actually third on Google's list of results, but it has recently become a favorite site of mine so it was a no brainer. 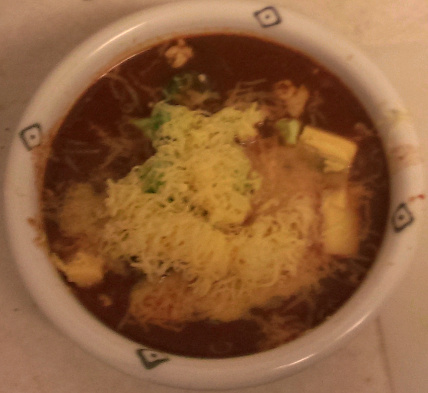 Overall, this chili was great, something I will definitely make again. I made some modifications based on our preferences and what I knew I had on hand at home. The original recipe calls for beans and tortilla chips, as well as whole coriander and cumin seeds; the beans and chips I omitted completely, and I used preground spices in place of the seeds. Hold the red bell pepper by its hopefully long stem over an open flame on your stove. Char as much of the bell pepper as you can handle, place in a bowl, cover it, and set it aside until it's cool enough to handle. 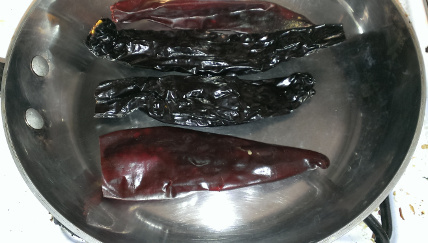 It's easiest to skip to the next steps while your pepper is cooling. Peel off as much of the bell pepper skin as you can. There are other methods of doing this step or you can buy fire roasted bell peppers at the grocery store, but this method is cheap and easy. Bring 2 cups of water to a boil in a pot with a lid on the stove. 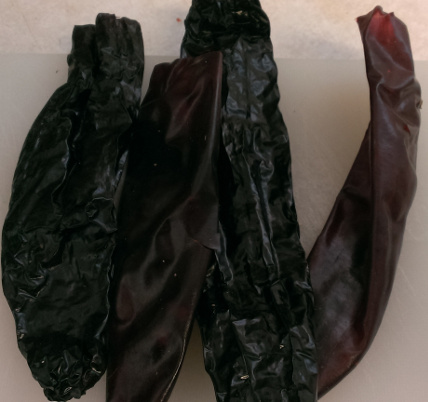 While waiting on the water to boil, cut the stems off the dried peppers and shake out as many seeds as you can. Toast the peppers in a dry skillet until they're fragrant, just a few minutes. Add the fragrant peppers to the boiling water, turn off the fire, cover the pot, and let them soak until they're soft. Toast the coriander and cumin in the same skillet over a medium fire until they're fragrant, about a minute. 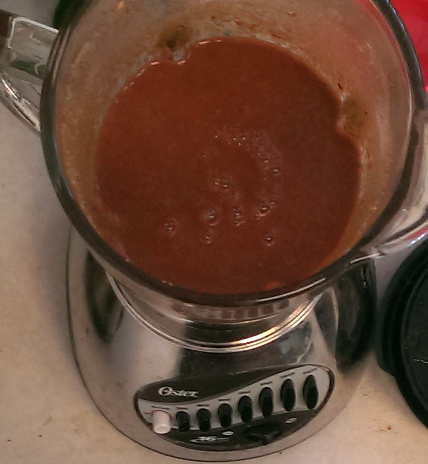 Add those two spices, plus the peppers and their water, the skinned bell pepper, cinnamon, chipotle powder, cocoa powder, and salt into a blender and puree. Heat oil in a pot and brown the short ribs. Set them aside on a plate. I cheated a bit in this step and browned the larger pieces of short ribs and then cutting them, rather than cutting and then browning. I find it's much easier to manage that way. Add the chopped onion to the pot and season with a bit of salt. Cook until translucent. Ad the garlic and oregano. Make a well in the middle of the pot and add the tomato paste to it. 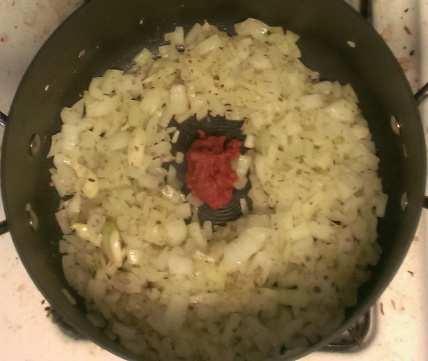 Cook for a minute and then stir it into the onion mixture. 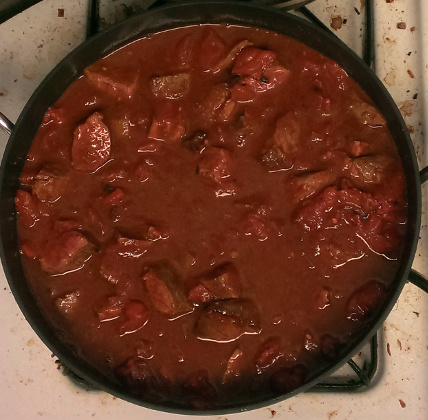 Add the short ribs back to the pot, along with the chile puree, the fire roasted tomates, and the stout. Stir. Cover and simmer over low heat for about 4 hours. Enjoy the remainder of the Chocolate Stout bottle. Garnish with your favorite chile toppings. We added sharp cheddar, jalapenos, and avocado. Holy crap and its so good too!